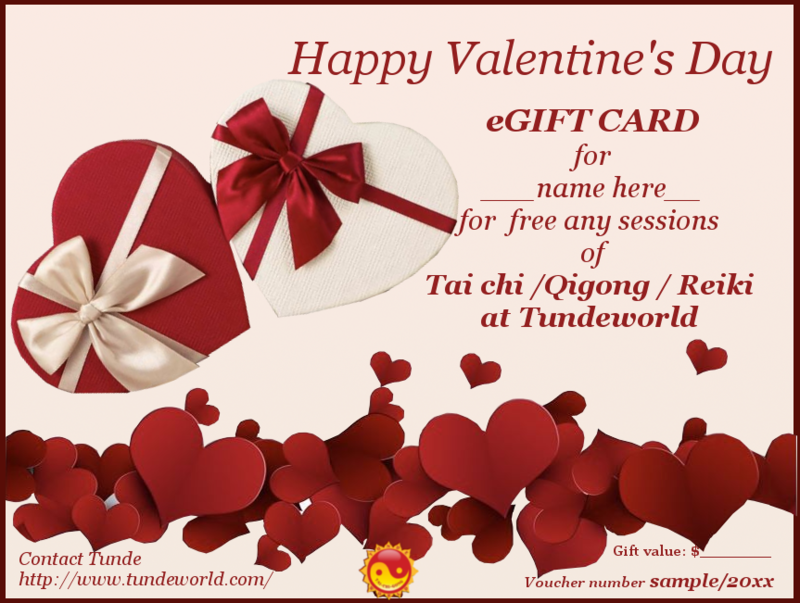 Valentine's Day eGiftVoucher | Tundeworld! While many may view planning for the big day of romance as a stressful prospect, there's no need to worry. Valentine's Day isn't something you necessarily need to plan far in advance. Whether you're looking to show your guy or girl how much you love them or even a little gratitude for mom or dad, we've rounded up some of the best Valentine's Day gift ideas for everyone on your growing list at Tundeworld. In fact, there is a lovely idea that you could try that will ensure that you enjoy together with you love. Doing something a little bit different with us. Buy an eGift Voucher for you loved and for yourself and Get 15% off Regular Price for private and for group sessions at Tundeworld. Where you can used this voucher? In private and group session (s) for Tai chi, Qigong, Reiki treatment or course and Meditation session. You can buy $25, $50 or you can choose the amount for. How you will have this? Only you need to do contact us via email or on the phone. Let us know the details. Once we had your payment we will send your eVoucher via email and you can print out for your love.